There is wide agreement that one of the most important things we can do to support and promote our own health is to give our bodies the nutrients it needs. There are many theories of nutrition out there, and we need to know what science has discovered that will aid in recovery and prevent recurrence. Jeanne Wallace is an expert on evidence-based nutritional and botanical support for wellness. We also need to know how to translate that science into the meals that come out of our kitchens. Rebecca Katz is re-defining the concept of health-supportive cuisine in a way that’s proving deliciously irresistible to patients and professionals alike. 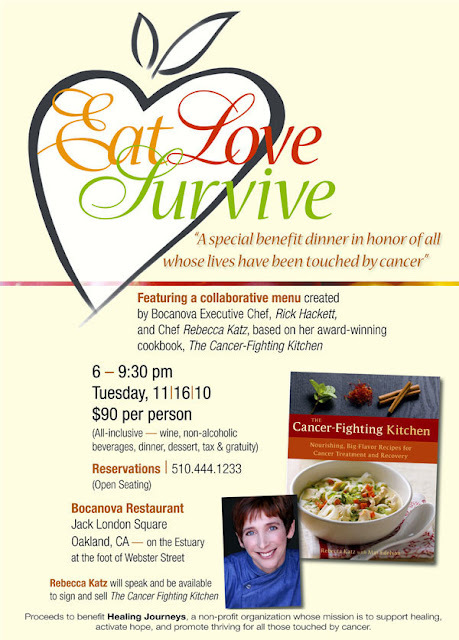 Using equal parts warm kitchen-table wisdom and credible scientific knowledge, Rebecca has helped thousands of people improve their health as they battle chronic diseases such as cancer, diabetes, and obesity. She will provide the practical help with healthy eating that you have asked for. 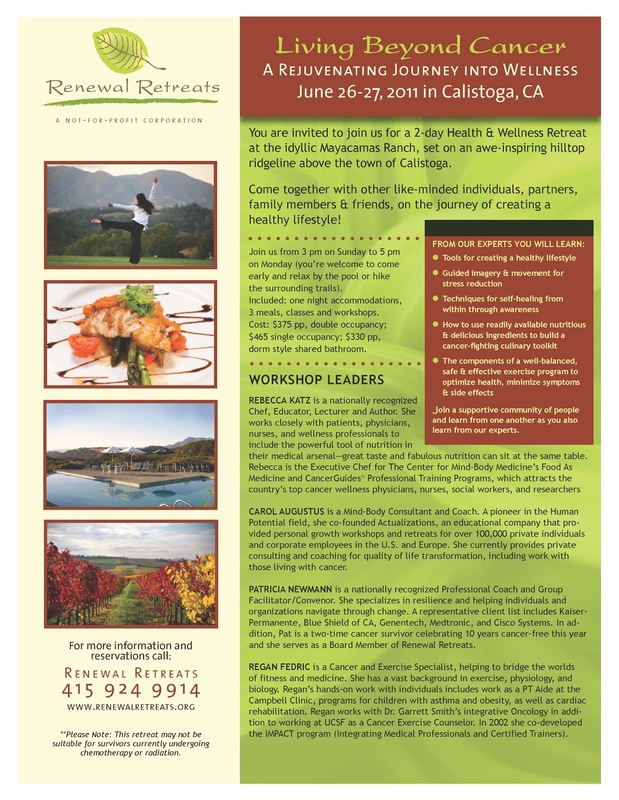 Anyone wanting to promote healing of mind, body, and spirit. Women and men touched by cancer or any life-altering. Learn diet strategies that strengthen the body’s resistance to cancer, complement medical care, and bolster recovery after treatment. 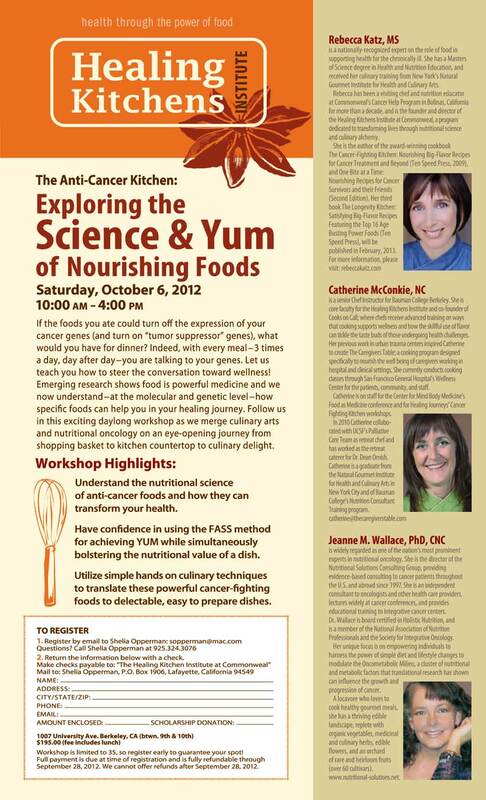 Discover specific foods that can significantly boost the body’s innate ability to resist cancer. that may influence cancer outcomes. Understand which foods are most important to avoid (and explore healthy substitutes). Learn how some foods (and spices) can alter gene expression, turning off cancer-promoting signals. Learn how to use herbs and spices to boost the immune system. Compare conflicting data and controversial claims of various anti-cancer diets and dietary supplements from a non-dogmatic, evidence-based model. Learn how to use flavor carriers to create healthy food that tastes great and is good for you. 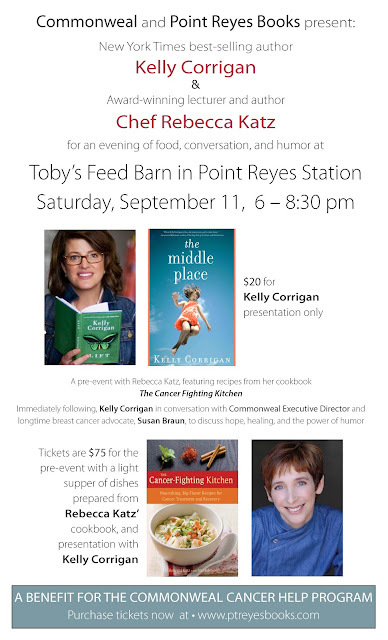 Join me as I help prepare a benefit dinner for Healing Journeys! The purpose of Healing Journeys is to educate, inspire, celebrate, and connect all whose lives have been touched by cancer or any life-altering illness. place I hold near to my heart: Commonweal's Cancer Help Program. It was a big night at the IACP Cookbook Awards Gala last month for THE CANCER-FIGHTING KITCHEN. It not only won the award in the Health & Special Diet category, but, thanks to all who voted, took home the “People’s Choice Award” as well—a remarkable accomplishment and a real honor for what Publishers Weekly called a relatively “obscure book,” especially since it was up against some of the biggest New York Times bestselling cookbooks. The People’s Choice Award, was presented by the venerable Judith Jones who is the most respected cookbook editor in the industry. She discovered and edited Julia Child’s first iconic book MASTERING THE ART OF FRENCH COOKING, and continued to work with Julia for nearly 60 years. After the award was presented, Ms. Jones and I were escorted back stage to have our pictures taken together. She said, “Julia Child would have loved this award, because it was given by the people.” I was so overwhelmed, it was all I could do to not fall over in my 4 1/2” inch heels. As we were posing for the camera, Judith turned to me and confided, “I don’t like having my picture taken from this angle.” She told me she had a trick for loosening up in front of the camera. A trick? A moment later, I could have sworn I heard Julia Child’s voice, “Now Judith, just say soufflé!” The flash of the camera popped, and Judith, a little pixie of a woman turned to me and grinned. Chubby cherries have taken center stage at the Farmer's Market. They are an illusive fruit, with a short season – blink, and you miss them. Their appearance, while brief, leaves a memorable imprint that wakens the taste buds with their burst of sweet, lush, juice. They won’t be in town long enough for you to become tired of their performance. One of the perks of eating during the spring/summer season, is there are more stone fruits waiting in the wings. Like many other berries, cherries contain ellagic acid, a powerful compound that blocks an enzyme that cancer cells need in order to develop. They are rich in antioxidants and stimulate the immune system. The darker the cherry the more nutrient rich they become. Be a cherry picker! 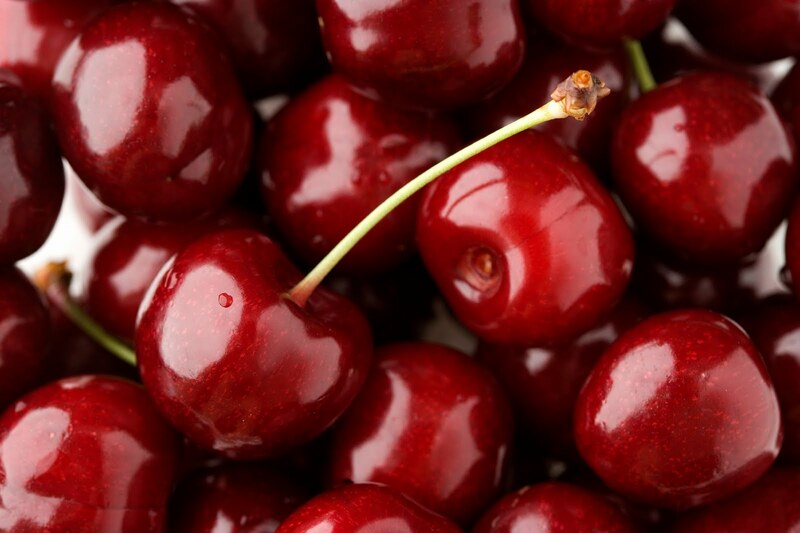 Select firm cherries that are bright, glossy and plump. Avoid those that are soft, leaking or too dark in color which can hide signs of decay or mold. Buy organic! Of all the fresh fruits, commercial cherries and grapes often contain the most toxic chemical residues. If you are buying them directly from a farmer, ask if they have been sprayed. Wash them well before eating. The great thing about cherries is there is no preparation involved. I give them a good rinse, put them in a bowl (sometimes) and eat them by the handful. If you want to be decadent, melt 8 ounces of organic dark chocolate, dip the cherries into the chocolate. Place on a lightly oiled plate and chill until set. A consultant, speaker, teacher and chef, Rebecca works closely with patients, physicians, and wellness professionals to include the powerful tool of nutrition in their medical arsenal. The Science and Alchemy of Yum! Copyright 2009 Rebecca Katz. All right reserved. Please complete for Rebecca's latest news and updates. We respect your privacy - your name and email address will never be given, shared, or sold to any other individual or corporation. How did you learn about rebeccakatz.com?